Developed by Chase Educational Consulting, a 501(c)(3) nonprofit, The Hovercraft Project travels to schools throughout the United States, Mr. Chase said. The program is geared for grades four through six, and the sixth-graders at Jefferson, working in teams, had the opportunity to build, test and compete in their hovercraft machines on Monday. Madison and Nightengale elementary schools are also on Mr. Chase’s upcoming schedule. 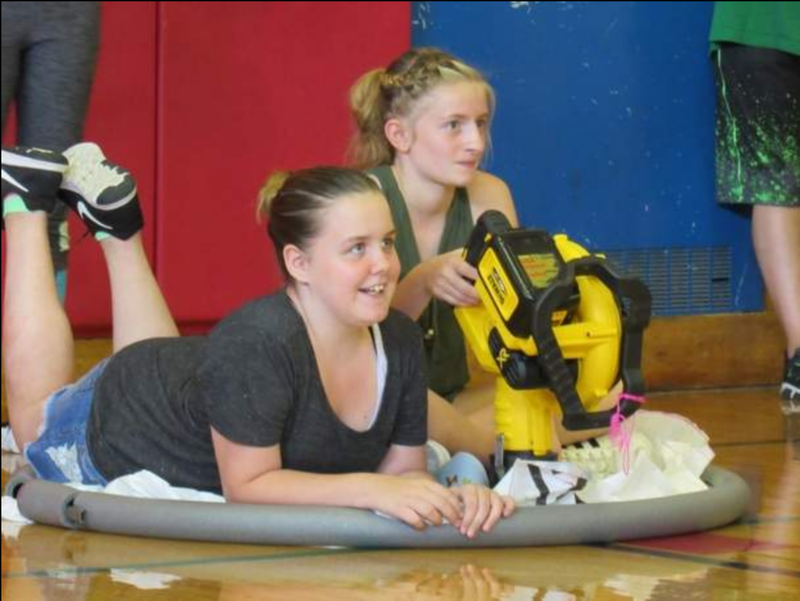 The competition was fierce on Monday when Jefferson Elementary School sixth-graders took part in The Hovercraft Project. Matthew Chase, executive director of The Hovercraft Project, gives the ‘go’ signal for hovercraft machines to start up and float across the floor at Jefferson Elementary School. The sixth-graders who took part in the day-long project were trying to get their hovercraft to travel as far as possible. 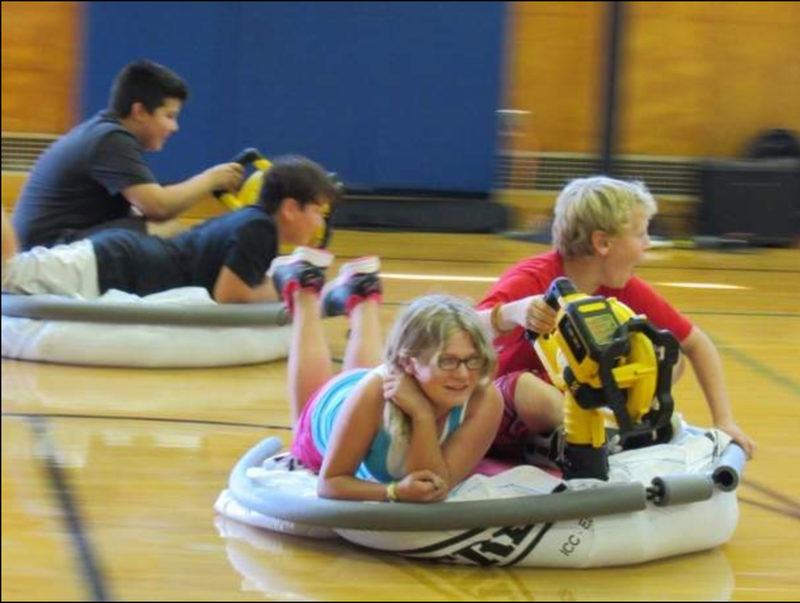 As part of an ‘in-school field trip,’ sixth-graders at Jefferson Elementary School built and rode a hovercraft machine across the gymnasium floor during a day-long, in-school field trip on Monday. Each hovercraft had one operator and one passenger. A team of Jefferson Elementary School sixth-graders make some last-minute adjustments to their hovercraft while other teams prepare to compete. The students took part in The Hovercraft Project on Monday. Matthew Chase, executive director of The Hovercraft Project, talks with Jefferson Elementary School sixth-graders on Monday as they participate in building and riding a hovercraft. He said he initially offered the program at one school, A.A. Kingston Middle School in Potsdam. Then, once other schools heard about it, the schedule began to build to 10 schools in the area. Jefferson Elementary School Principal Duane Richards said Superintendent Patrick H. Brady had made them aware of the program at the end of the 2016-17 school year to gauge the interest of principals. Mr. Chase said the project teaches leadership and teamwork, as well as science, technology, engineering and mathematics (STEM). “It’s an integrated curriculum. It relates to all subjects,” he said. Mr. Chase brings all the materials needed to create the hovercraft, which are low-friction vehicles that ride on a thin current of air. Among the parts used to build the hovercrafts on Monday were pipe insulation, PVC sheeting, a standard rubberized mat, and a leaf blower that’s attached to standard pipe fittings. Groups of six to eight students measure and cut out the skirt, assemble the hovercraft components, test and evaluate, make changes to increase performance, push test with riders, and compete for distance. A team leader is selected for each group and assigns different portions of the project to his or her team members. “Each kid has multiple jobs. There are up to four jobs they have to complete,” he said. The schedule included time for Mr. Chase to talk to the students about what they’ll be doing, followed by students creating a team name and team flag. They then measured and cut out the hovercraft skirt, assemble the craft and conducted three tests before lunch. “It’s mainly based on mathematics up to this point,” he said. Once they returned in the afternoon, they competed in a push distance competition for prizes, and then further modified their hovercraft, which adults also had an opportunity to ride. The hovercraft can hold up to 750 pounds, he said, but there’s no damage to the floor because the machine rides on a current of air. As part of the distance competition, the students had to determine, with no tools in their hands, how far their hovercraft had traveled on the gymnasium floor. Mr. Chase said some students use their feet to measure the distance, while others may use a body length. The key, he said, was to make sure the same person was doing the measuring for each test so they had an accurate comparison.